What Is the Environment Hub? Describe the tasks you perform from the Environment Hub. 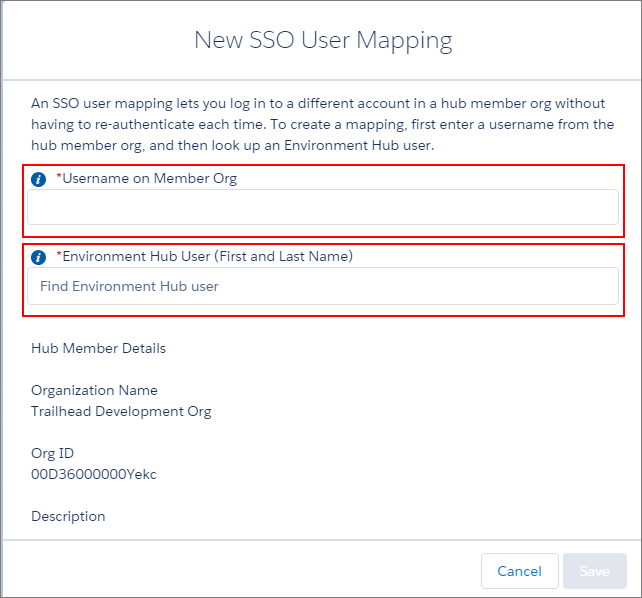 Describe how to set up single sign-on to member orgs in the Environment Hub. It’s time to start creating orgs. The Environment Hub app is your one-stop shop for org creation and org management. Using the Environment Hub app, you can connect existing orgs to the hub. You can create standard and partner edition orgs for development, testing, and packaging your app. You can set up single sign-on from your hub org to its connected orgs to provide easy access to development and testing orgs. If you want to try out the steps in this unit, you need an org with the Environment Hub app. If you have the System Administrator profile, you have the permissions necessary for using all the Environment Hub features. We are going to assume that you have those superpowers and that you can’t wait to create an org. But if you want other users to access the hub or you don’t have those permissions, you can go set them up now. Learn more about the permissions for hub access in the Configure the Environment Hub section of the ISVforce Guide. 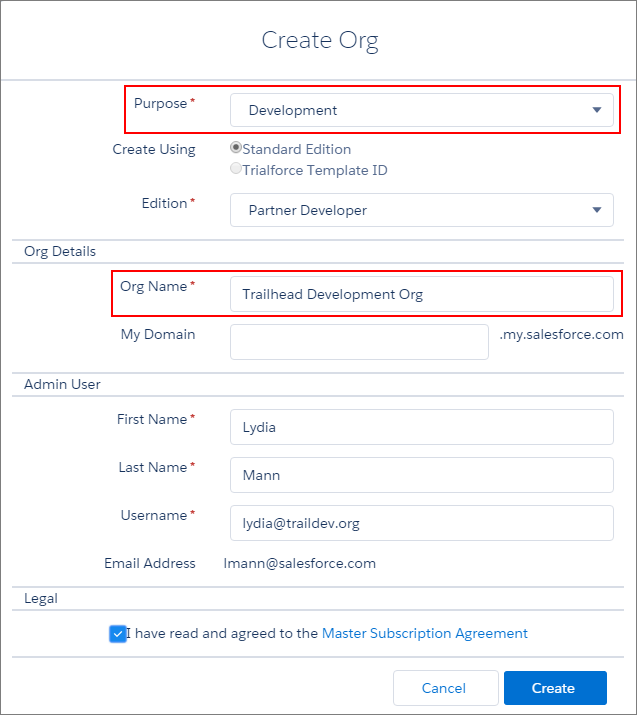 You or your Salesforce admin can set up a new profile, modify an existing profile, or create a permission set with the correct permissions. If you’re a partner and have set up your development management org, you need to enable My Domain in that org. See the User Authentication module for instructions on how to set up My Domain. Now let’s create a development org in which you can create a simple app. From the App menu, select Environment Hub. From the ITEMS list, select Environment Hub. For Purpose, select Development . In Org Name, enter Trailhead Development Org. Fill in the remaining required fields. Since this is a new org, you must enter a new user name, as user names cannot be reused across Salesforce orgs. Read the Master Subscription Agreement and choose whether to accept. When your org is ready, you receive an email confirmation, and the org appears in your list of hub members. When the email arrives, click Verify Account to activate the org. Before you continue, make sure that you have the AppExchange partner version of the Environment Hub. Verify that your Edition picklist looks like this one. 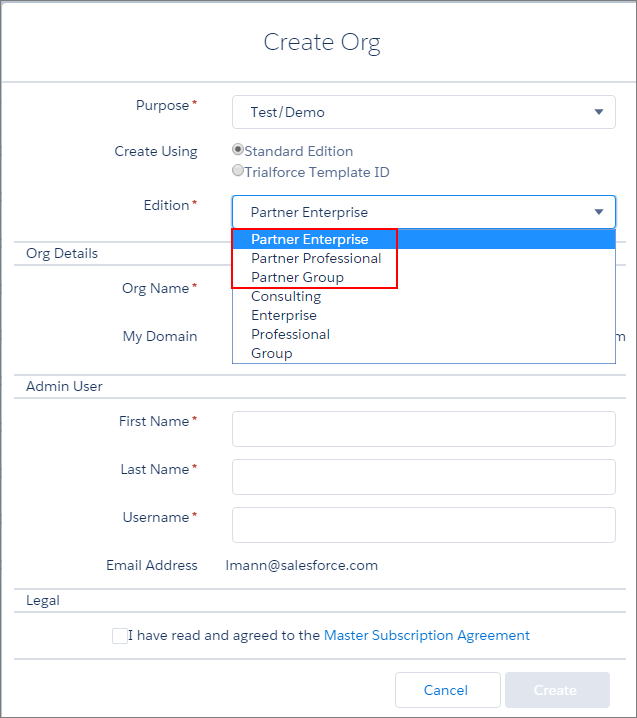 If you don’t see the highlighted edition options, file a case in the Partner Community to get the AppExchange partner Environment Hub. The Partner editions last for one year. Non-partner editions have a shorter lifespan. When your org is ready, it’s listed as a connected org in your Environment Hub. Notice the drop-down menu on the right. It has a Login option. If you haven’t set up SSO, Login simply takes you to a login page. Let’s activate SSO to make full use of the Environment Hub. Select the org name from the list of environments. Confirm that you do want to enable SSO by clicking Enable SSO on this new screen. Go to the Single Sign-On User Mappings related list, and select New SSO User Mapping. For Username on Member Org, look up a user in the Environment Hub. For Environment Hub User, enter the username you used to set up Trailhead Development Org. You are now logged in to the related org. Useful, isn’t it? When you logged in to the member org, you didn’t provide a password. Connecting without a password is possible because you created the org using the Environment Hub. Check out the Single Sign-on in the Environment Hub section of the ISVforce Guide for other SSO methods that you can use for connecting orgs. It never hurts to practice, right? And really, we need a test org in which to load the package containing your app in the next unit. So, here goes. In Org Name, enter Trailhead Test. Fill in the remaining required fields. Remember, this must be a new username, as it must be unique across all Salesforce orgs. Read the Master Subscription Agreement, and then choose whether to accept. Don’t forget. Look for your email confirmation, and wait for your org to appear in your list of hub members. After you have the confirmation and have verified your account, go ahead and set up SSO to make your life easier. You’re going to create many orgs over the lifetime of your business. Using custom list views with the Environment Hub app makes your life easier by helping you to find orgs quickly. When you create a custom list view, you set filters to determine which orgs you see and to specify the columns to display. Maybe you’re an enthusiast who started creating your app in a Developer Edition org before you signed up as an AppExchange Partner. Or maybe you have some other orgs hanging around that you’d like to access from your Environment Hub. No problem. Here’s how. Log in to the Environment Hub, and then select Connect Org. Enter the admin username for the org that you want to connect and, optionally, a short description. A description makes it easier to find the org later, especially if your hub has many members. By default, single sign-on (SSO) is enabled for the org you connected. To disable SSO, deselect Auto-enable SSO for this org. In the pop-up window, enter the org’s admin username and password. If you don’t see the pop-up, temporarily disable your browser’s ad blocking software and try again. Select Log In, and then select Allow. At some point, your company could grow to the point that you want to have another org with an Environment Hub. It’s easy to disconnect an org from an Environment Hub using the Remove command. And it’s easy to connect it to the same Environment Hub again. However, to connect it to a new Environment Hub, you submit a case to Partner Support to break the association to the previous Environment Hub. Create an org using the Environment Hub. Connect an existing org to the Environment Hub. Use custom list views to help you stay organized. Bravo. Take the quiz, then on to the next unit where you get to use those orgs.